Danielle Weeks was forced to evacuate her home and hunker down in a hotel. A cloud of uncertainty now hangs over an expectant mother who had to flee her home in Texas to avoid Hurricane Harvey's wrath: She's slated to have a C-section on Tuesday, but now that the Category 4 storm has slammed into the Lone Star State, she's unsure if it'll happen. Danielle Weeks -- joined by husband William Weeks and their daughters Annabella, 5, and Alizabeth, 18 months -- fled their home in Port Aransas after being told to evacuate. They headed to a Best Western, only to be evacuated from there and forced to move to another hotel. Weeks' mother is with the family, too. So now, surrounded by bags of belongings and a weekend's supply of food, the family is hunkering down at a Holiday Inn in Corpus Christi, located about 45 minutes west of Port Aransas. "I don't really know what's going to happen,” Danielle told ABC News of her scheduled C-section, which she says her doctor told her is medically necessary. "We have to call [the doctor] on Monday," William chimed in. "That'll be the next news we get -- is what to do on Monday." (Janet Weinstein/ABC News) Elizabeth Weeks at a hotel in Corpus Christi, Texas, on August 25, 2017, with her family after they evacuated their home due to the arrival of Hurricane Harvey. (Janet Weinstein/ABC News) Anabella Weeks at a hotel in Corpus Christi, Texas, on August 25, 2017, after her family evacuated their home due to the arrival of Hurricane Harvey. And in addition to worrying about the delivery of their child, the Weeks said they are also nervous that their home, an RV, might not make it through the storm. They moved in a month ago after relocating from Colorado. "Knowing in a couple of days that we might not have our trailer anymore ...," William says, trailing off before starting to tear up. Finishing her husband's sentence, Danielle says, "It's kind of scary." Hurricane Harvey made landfall in Texas late Friday night, slamming coastal areas with maximum sustained winds of 130 mph with even stronger gusts. It's the strongest to hit the state in decades, with catastrophic flooding expected. 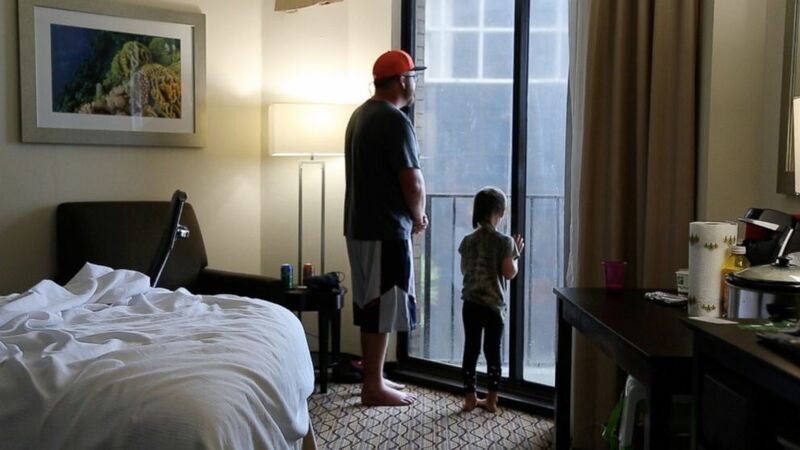 (Janet Weinstein/ABC News) William Weeks and his daughter Anabella at a hotel in Corpus Christi, Texas, on August 25, 2017, after they were forced to evacuate their home due to the arrival of Hurricane Harvey. For now, eldest child Annabella bounces around the small hotel room, enjoying what she assumes is an impromptu vacation. Meanwhile, her little sister Alizabeth sleeps soundly on a double bed. Said William: "We just have to take it day by day and see what happens."